Inspiration can strike at the oddest moments. Some days the ideas come so fast that I have to write them down for fear of forgetting. Other times it can be elusive, too many thoughts run through my mind and I can’t focus on just one. This recipe came from a lone cauliflower languishing in the back of my refrigerator. How could I turn it into a meal? Roasting came to mind and then I thought about what would pair well with it and give it a lot of flavor. Sheet pan dinners are great time savers during the week when you don’t have the energy to do a lot of cooking. Prep and clean-up are relatively easy and you can make a double batch and have leftovers for later. 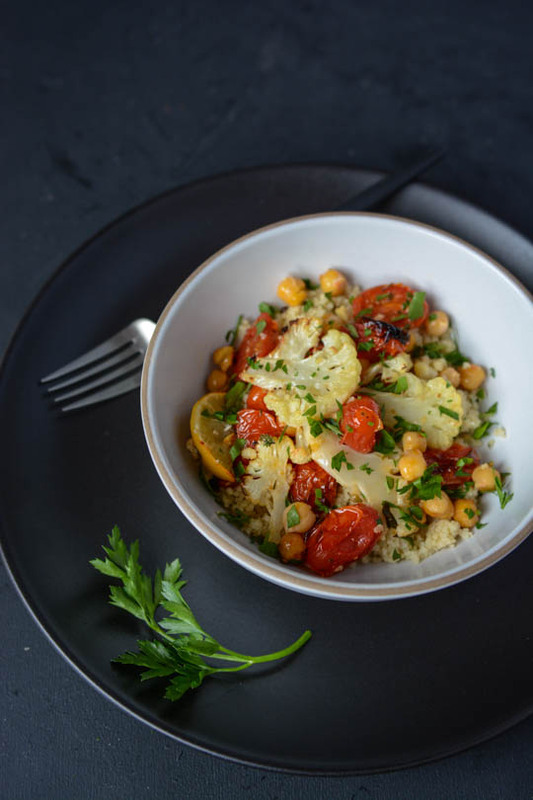 This dish couldn’t be easier, just toss together some cherry tomatoes, a can of chickpeas and a head of cauliflower with some olive oil and lemon slices. 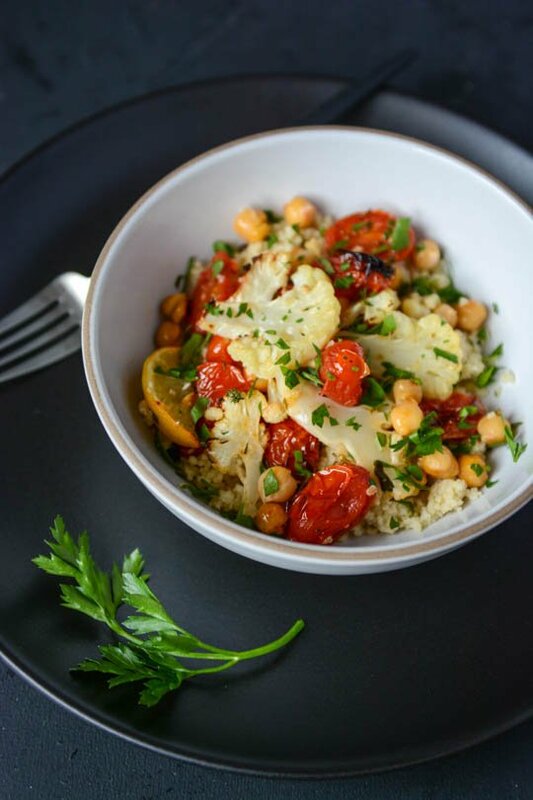 I serve it up over some steamed couscous and drizzle of my favorite tahini sauce on top. Drain and rinse the garbanzo beans and place in a large bowl. Cut the cauliflower in half, remove the tough inner stem and break into florets. Thinly slice the florets and add to the bowl along with the tomatoes and lemon wedges. Add the olive oil, garlic, chili flakes, salt and pepper to the bowl and toss to make sure everything is coated in the oil. 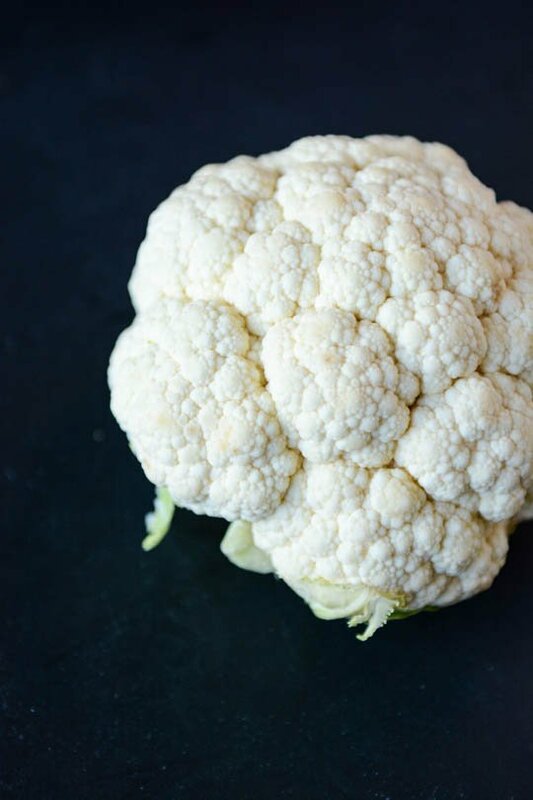 If you cauliflower is really large you may need to use an additional tablespoon of oil. Line a baking sheet with parchment paper and spread the vegetables over the top. Cook for 25 to 30 minutes stirring occasionally. 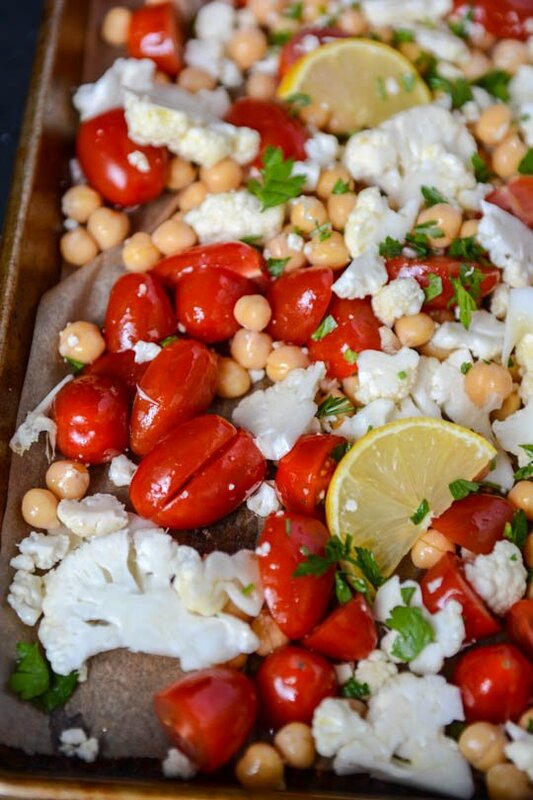 The tomatoes should start to release their juices and the cauliflower starts to turn golden brown. To Make The sauce Combine The Tahini, Garlic, Lemon Juice, Vinegar, And Water In A Blender And Puree Until Smooth. Taste And Add Salt And Pepper To Taste, You May Also Want To Add Additional Water If Necessary If It’s Too Thick. Remove the lemon wedges before serving. 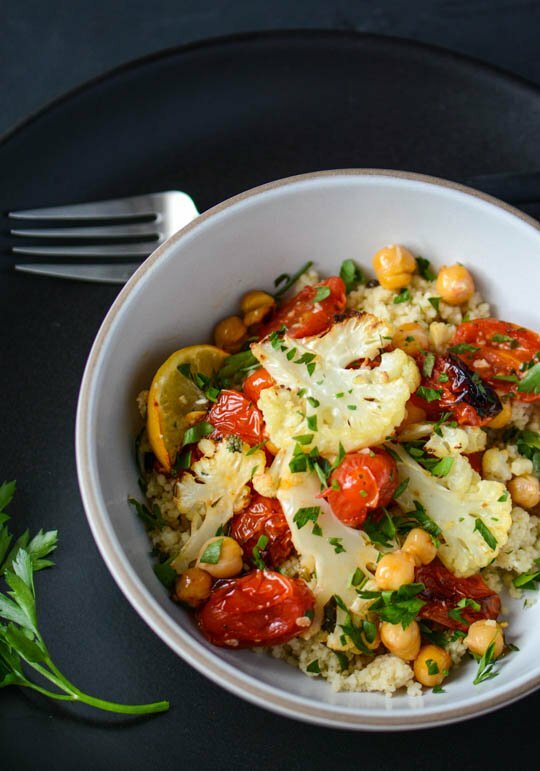 Sprinkle the parsley over the top and serve over couscous or quinoa. Drizzle the tahini sauce over the top. We tried this a few days ago, and it was delicious! Thanks Kara, I’m so glad you enjoyed it! I made this last night: yummy! So healthy too. I have a general question about parchment paper. I don’t use it much unless a recipe calls for it. Is there a reason you like to use it? Just curious. Thanks for the great recipes and inspiration! Thank you for this recipe. I made it last night and it did not disappoint. The only thing I changed, because I am on a mission to remove all added oils from my diet for health reasons, was omitted the olive oil. I moistened the veggies with just a little vegetable stock and then sprinkled on the seasoning. I am pleasantly surprised that I didn’t even miss the olive oil! I served it over whole wheat couscous. I will definitely be making this again! Thanks again! I’m so glad you enjoyed the recipe. I love the fact that most of it is on one sheet pan. I tried the low-fat, no oil thing for a long time but I have to be honest, since I cut back on processed carbohydrates and increased my fat intake, I’m losing weight for the first time after being stuck for a year or so. Good luck with the healthy eating, I know it can be a challenge! I love this recipe! I’m always searching for new ways to make great tasting meals while staying away from simple carbs/processed food and this is a win. I’ll be making it again. Thanks! Thanks so much for trying the recipe. I am all about keeping it simple. There are days when I want to experiment and spend hours developing flavors but most days quick and dirty is what I’m really all about! Sounds delicious, can you use any kind of beans? Borlotti? Mixed? If I don’t have apple cider vinegar, could I use another vinegar instead? You could easily swap out sherry vinegar or red wine vinegar instead of the apple cider vinegar. You could even leave it out altogether but I would add a little extra lemon juice if you don’t use the vinegar. I hope you enjoy the dressing if you try it, it’s amazing on salads or as a dip for vegetables! Let me know how it goes and thanks for trying the recipe! Hi, I stumbled upon this recipe and just made it. It was delicious. Though, as I love roasted lemons, I ate them as well. Also, added pine nuts and za’atar. Thank you! Are the tomatoes halved or left whole? 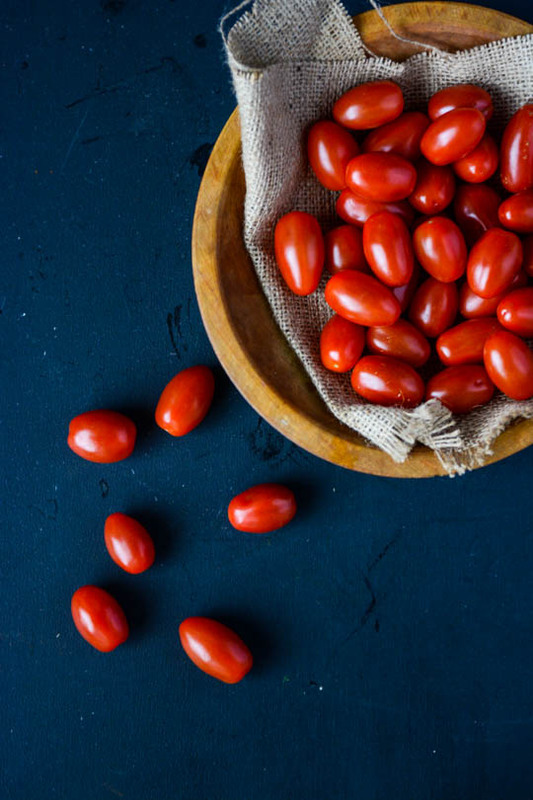 I leave the tomatoes whole, as they roast they will burst open and develop an amazing sauce for the chickpeas and cauliflower. You could cut them in half if you’d like, they just won’t keep their shape quite as well. I hope you like the recipe if you give it a try! This sounds delicious! I have made roasted cauliflower, tomatoes, and zucchini several times, it is delicious, and even my vegetable-averse husband loves it. I love the idea of adding chickpeas to give it a little bulk. This is the first recipe of yours that I have tried and i was quite impressed. It was simple to make, healthy and I have leftovers for tomorrow. I will be back to try more. I’m so glad you enjoyed it. This is one of my favorite go-to recipes when I don’t have the energy to pull out a lot of pots and pans. Thanks for trying the recipe and the kind words! So simple but absolutely delicious! I added toasted, flaked almonds which really complemented the dish and ate it over wholewheat couscous. Sadly I had no tahini in stock so made a harissa sauce instead but I can’t wait to try your suggestion next time – I’ll be making this again for sure! Thank you! I’m so glad you found the recipe helpful! The addition of the almonds sounds like a great idea! The sauce is a great addition but harissa is a great substitution! Thanks for trying the recipe!